Amino AcidsTrec BCAA X Tank - 30 kaps. Trec BCAA X Tank - 30 kaps. This preparation is a solid dose of BCAA in each serving. Branched chain amino acids, which include L-isoleucine, L-leucine, L-valine, are organic substances with strong przeciwkatabolicznych, delaying the onset of fatigue and speed up recovery after training. These amino acids, as well as vitamins include exogenous substances, which means that they must be delivered to the body with food. The product BCAA X-Tank is not only a mega strong branched chain amino acids but also pro anabolic taurine. It encourages the development of new muscle tissue, and as BCAA inhibits the secretion of serotonin, the hormone that causes decay reactions in the muscles and causing fatigue. This amino acid is a guarantee of long and effective training! This supplement also contains L-tyrosine, which helps to improve physical and mental, as well as reducing the time needed for recovery after training. Tyrosine is used by the body for the synthesis of thyroxine, which increases protein synthesis. Vitamin B6 is in turn inseparable addition of BCAA complementary action - supporting protein synthesis. BCAA X-TANK is an extremely effective formulation having the amino acids with branched side chains (L-leucine, L-isoleucine and L-valine) in the body for optimum ratio of 2: 1: 1. They exhibit a strong anabolic effect and constitute nearly 40% of lean muscle mass. BCAA X-TANK supplemented with taurine, L-tyrosine and Wit. B6. As a result, it effectively supports the processes of energy and suppresses fatigue and protein catabolism. BCAA X-TANK is recommended for daily sports supplement the diet with BCAA amino acids necessary for growth and regeneration of muscle. Training is a real proving ground, where you have to fight to survive. There is no place for wimps! Enveloped fatigue and impotence? After the effort you feel exhausted? Try a new weapon that will trigger in you hidden strength and accelerate muscle recovery! 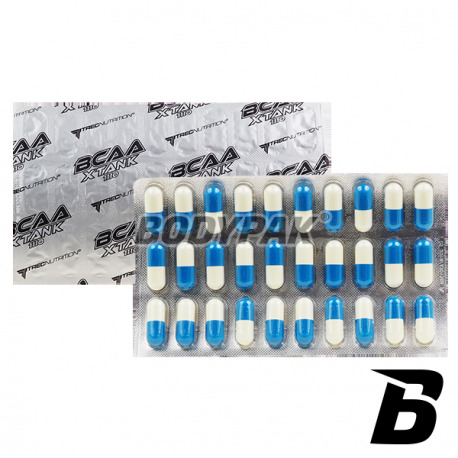 BCAA X-TANK is an extremely effective formulation having the amino BCAA ratio of 2: 1: 1. In addition to optimal for the body of L-leucine, L-valine and L-isoleucine, the product was further armed taurine, L-tyrosine, and vit. B6. Thanks to more effectively supports the production of energy during intense exercise and suppresses fatigue. BCAA X-TANK is also an extremely effective anti-catabolic, providing the necessary protection for your muscles during both training and throughout the day. Use of technology KING SIZE it possible to load a record dose of amino acids to each capsule - 1110 mg.
Intense physical activity is for our body a huge challenge. At one moment he must mobilize all its forces to be able to face ever greater training load. Everything, however, has its limits - when the exhausted stocks of carbohydrates, our body is looking for another source of energy. To keep power for intensive shrinking muscle fibers retooling it with quick, wasteful metabolism of sugars to more efficient, but it is slower metabolism of fatty compounds. Unfortunately, this requires a lot of time, and during a really hard workout counts Every second. Therefore it runs indirectly the production of energy - oxidation of amino acids. As a result, the protein building our muscles are degraded by catabolic enzymes to free amino acids, which are then used as an alternative fuel. It is mainly for the production of the body uses amino acids with branched side chains (Branched Chain Aminoacids), which alone can be metabolized directly into muscle bypassing the liver. This particular property L-Leucine, L-isoleucine and L-valine allows training to maintain power and muscle further work. BCAA account for nearly 1/3 of all the amino acid building our muscles, so their burning results in a gradual reduction of their weight and may limit our progress training. However, we can defend before supplementing your diet with additional source of branched chain amino acids such as BCAA X-TANK. BCAA are one of the most important amino acids for your muscles! Not only support the process of energy production during exercise, but also delay the symptoms of fatigue. Branched chain amino acids protect muscles against catabolism and induce anabolic processes leading to their growth. It is necessary nutrients that the body can also be freely customized to your needs, transforming them into other amino acids. Although the BCAA account for about 15% of all amino acids building protein supplied in food, it is necessary to use them is complicated digestive process. So what to do to meet the growing demand for amino acids, branched chain associated with intense training and provide for the needs of our muscles? The most effective solution would be to their completion in the form of a concentrated supplement. So given BCAA amino acids are absorbed quickly and after a few minutes reach via the bloodstream to our muscles, or to the place of its operation. Numerous scientific studies confirm the benefits of products containing free amino acids BCAA. Is it possible to further strengthen their action? Yes! Experts TREC NUTRITION have developed a completely new product that works even more than the same branched chain amino acids. It's a completely new weapon in the fight for powerful muscles and maximal exercise performance. BCAA X-TANK is the unique combination of excellent ratio of L-leucine, L-isoleucine and L-valine (2: 1: 1) and taurine, and L-tyrosine with the addition of vit. B6. As a result, BCAA X-TANK more effectively promotes metabolism exercise, securing the energy needs of the muscle cells, so they can work even longer and more intensely. The formula has the highest quality free amino acids, which rapidly reach the bloodstream. High levels of BCAA during exercise inhibits the release of tryptophan and the process of transforming it into serotonin responsible for the feeling of fatigue. The addition of taurine and tyrosine, which are used include for biosynthesis of neurotransmitters, further enhances this effect. That's why BCAA X-TANK stronger than the classic formula of BCAA increases concentration and motivation for long and exhausting workouts. Taurine and L-Tyrosine also have a strong influence on lipid metabolism - the process stimulate the production of energy from fat reserves. That's why BCAA X-TANK not only helps build the hard and strong muscles, but it also speeds up metabolism and fat burning. This product should be a regular part of weight loss diet - it contains ingredients inhibit catabolic processes and support the production of energy needed for exercise. In addition, taurine and L-tyrosine support the work of the nervous system and have a positive effect on mood, which is especially important for long-term caloric deficit. BCAA X-TANK is a universal amino acid preparation, which should serve as the basis for supplementation in physically active people. The positive effect of BCAA, taurine and L-tyrosine will feel all athletes, regardless of the type of discipline and specificity of training. 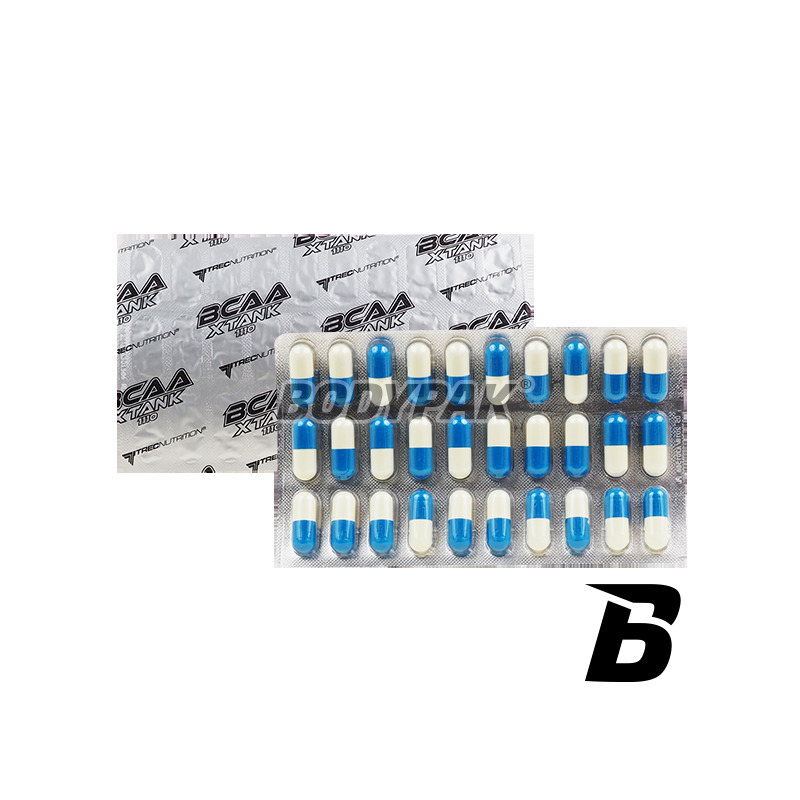 BCAA X-TANK during intensive stimulates the production of energy and inhibits the adverse effects of catabolic enzymes. After use it contains free amino acids branched activates anabolic pathways leading to the regeneration of injured muscle protein structures. The use of BCAA X-TANK allows you to increase the intensity of exercise, accelerate its progress training and reduce the risk of overtraining. and serving in the morning after waking up, one portion between meals, serving just before bedtime. Skutecznie chroni mięśnie przed katabolizmem, jak dla mnie ok - 5/5!